Domestic violence refers to a pattern of abusive behaviors by one or both partners in an intimate relationship. The people in question could be married, dating or cohabiting. It has many forms and goes beyond physical aggression. It includes threats, emotional abuse, domineering, intimidation, you name it. It is worth mentioning that though the definition of domestic violence seems simple enough, it's application varies quite significantly. Why do men hit women? When talking about domestic violence, emphasis tend to be on women, as victims, because statistics show that women suffer greater rates of injury as a result of domestic abuse. Last year, 2009, many cases of domestic violence were brought to the lime light - the most conspicuous being the Chris Brown - Rihanna saga. Over the years, many women have been victims of domestic violence. Unfortunately, not all of the cases are reported. Celebrity cases, however, usually attract a lot of attention and media coverage. 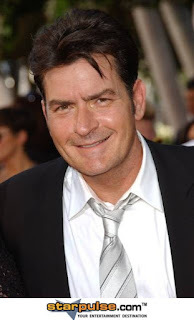 On Christmas eve, last year (December 24 2009), one of my favorite actors - 44-year-old Charlie Sheen (in the picture above) was arrested and spent the better part of Christmas day in a Colorado jail cell. He was arrested on allegations of domestic violence and dragged to jail on Christmas morning by officers who responded to a frantic 911 call. Be rest assured, no one was hurt. An ambulance went to the house but the accuser, who later turned out to be his wife, Brooke Mueller Sheen, was not taken to the hospital. I still can't comprehend why the "funny" star of "Two and A Half Men" would hit his wife. Keep in mind that this is still an allegation. He is innocent until proven guilty! However, according to the Aspen police spokeswoman - Stephanie Dasaro, Charlie is being investigated for second-degree assault and menacing, both felonies, along with criminal mischief, a misdemeanor. Charlie was released on bail ($8,500) and slammed with a restraining order. At the end of the day, was it worth it? Sheen's publicist, Stan Rosenfield, warned that we shouldn't jump to any conclusion about the scandal. I agree. But what would prompt a "funny" guy like Charlie to hit his wife? No doubt, men frequently blame domestic violence on alcohol consumption, mental illness, their father beat their mother, love, fear, no self-control. Who cares? When allegations of domestic violence are recurrent, as in Charlie's case, there's a major cause for concern. The perpetrator in question, needs to be stopped before it's too late. Charlie Sheen could be termed a "repeat offender" on the loose - in December 1996, he was arrested for attacking a girlfriend at his Southern California home. How many more 911 calls have to be made before he's stopped? We can talk all day about domestic violence but it all boils down to the fact that there's no excuse for the offence. It should not be tolerated! I don't tolerate violence against women; nobody should. My wish is that survivors and perpetrators of domestic violence get help. In a civilized society, domestic violence has no place. I'm not an advocate for divorce or break-ups. But I'm tempted to ask, why do women stay? If a man hits you, chances are he'd do it again. I'm concerned about this subject because I know domestic violence is cowardly and the consequences are grave. Besides, I have a mother and 4 sisters! I don't want something like this happening to any of them. It's a shame that domestic violence still exists today.We need more men to stand up and challenge violence against women because REAL MEN DON'T HIT WOMEN! I think that when men begin to understand that there are consequences to this behavior, they will begin to think twice. Chris Brown's career has suffered because of the Rihanna incident, If Sheen did this and he suffers for it, others will learn. Thanks for shinning a light on this important topic.